Ryan Saunders was thrown into a life of basketball at a young age. His father Flip was heavily invested in the basketball world and is one of the most respected figures in the sport’s history. With the recent firing of Tom Thibodeau, Ryan has been given the opportunity of a lifetime. A chance to coach his father’s beloved Timberwolves. 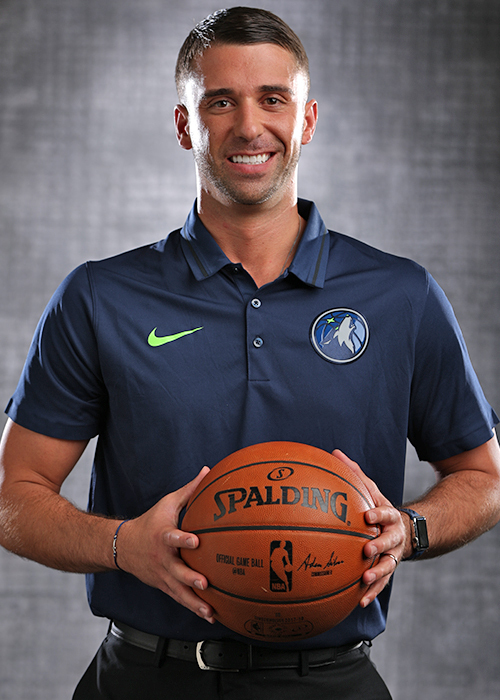 Ryan Saunders get his first opportunity as a head coach with the Timberwolves. Photo by the Minnesota Timberwolves. Saunders is already Minnesota fan favorite at the age of 32. He was born in the land of 10,000 lakes and his father developed quite a positive reputation of the Saunders name as a coach for the Timberwolves. As a graduate of Wayzata High School in Plymouth, Ryan went to the University of Minnesota as a basketball walk-on, where he would play for four years. After his graduation in 2008, he became a graduate manager for Tubby Smith and the Gophers in the 2008-2009 season. Ryan would receive his first opportunity to coach in the NBA with the Washington Wizards in 2009, as he was hired by then new coach Flip. When Flip was fired from Washington in 2012, Ryan stayed on the staff. 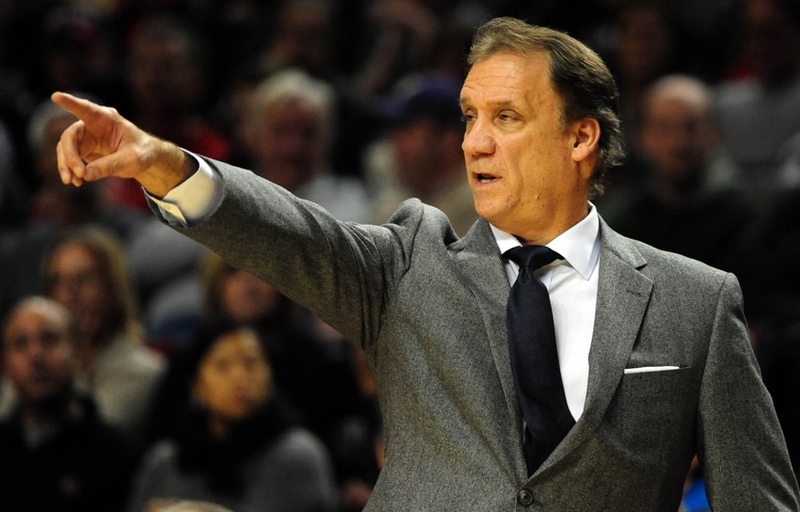 In 2014, when Flip began his final coaching stint with the Timberwolves, he hired Ryan to be an assistant. With the abrupt and heart-breaking passing of his father in in 2015, Ryan was now set to carry on his late father’s legacy. When Thibodeau was fired earlier this month, Minnesotans were excited to see Ryan get his shot. He made an impact on the team and fans almost instantly. After a heroic effort in his first game as head coach, the Timberwolves pulled off an inspiring win against a solid Oklahoma City team on the road. After the game, all of the players swarmed Saunders and the new era began in a very positive way. Ryan is known for his accolades in the field of player development and his ability to connect with the younger players. This bodes extremely well for a Timberwolves team that has plenty of exciting young talent, and especially for Andrew Wiggins. Wiggins seemingly hit a regression in the Thibodeau era and looked all out of sorts. He often looks confused and uninterested in playing (especially on the defensive end) during Thibs’ tenure with Minnesota. When Saunders was hired, Wolves fans hoped that “max” Wiggins would be released, a player that Minnesota faithful had seen just a handful of times a year. Wiggins had an inspiring game, full of energy and hustle plays that ultimately led to a much needed Timberwolves victory. “Maple Jordan” had an outstanding stat line, finishing with 40 points, 10 boards, and four assists. He was also big in the clutch, coming up with a lay up to put the Wolves ahead for good and an assist on a Josh Okogie three to put the game away. After the game, Wiggins had nothing but love for Saunders, who is the only remaining coach from Wiggins’ rookie season with the Timberwolves. After just one week on the job, it appears that Saunders is already changing the attitude and culture of the Wolves. Jon Krawczynski, who is a senior writer for The Athletic, covers the Wolves and was able to get an idea of this culture change at a Timberwolves’ practice under Saunders. While it is a simple change, it can go along way, especially after the stagnant and dull Thibodeau era. A seemingly small change in the culture could go along way for the Wolves, per Jon Krawczynski. The young Wolves were seemingly held back during the Thibodeau coaching years as he was tabbed one of the last “old school” coaches in the NBA. The new generation of basketball is all about effective and efficient guard play and three point shooting, something the Wolves lacked with Thibs. In the first three games under Saunders, the Wolves have started to play a more run-and-gun style of play and they are shooting more threes than ever before. They are shooting an average of 31 threes per game, with a percentage of about 34%. With the roster the Wolves currently possess, a fast-paced offense with a healthy blend of three pointers could be exactly what they need. Saunders to0 seems to have realized this and is implementing a different strategy as quickly as he can. Going back to Andrew Wiggins, his style of play with Thibs at the helm featured a healthy dose of long two-point jumpers. This shot is a poor choice in today’s basketball world, as just a few steps back equates to another point on a made field goal. Saunders has seen this trend with Wiggins and the rest of the Wolves and clearly wants it to end, which is refreshing to say the least. Interesting Timberwolves note: Interim head coach Ryan Saunders says one of his goals has been improving shot selection, specifically avoiding long twos. In a scrimmage the other day, long twos were worth negative points. Smart & modern thinking. Ryan Saunders is adopting to the modern day NBA early in his head coaching career. Per Reid Forgrave. Modernization and creativity is something the Timberwolves clearly lacked with Thibodeau coaching, and a change was desperately needed. Minnesota fans everywhere want to see Ryan Saunders succeed. Ryan has the ability to create of new style of play with the young Wolves and that will only bring more success to a team needing to reach their full potential. The entire state of Minnesota will be rooting for Ryan to succeed and of course, so will Timberwolves legend, Kevin Garnett.